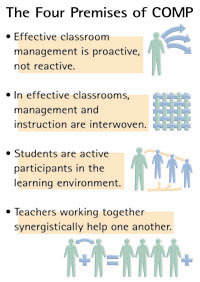 COMP is a proactive program for managing classrooms that has demonstrated increases in student engagement and academic achievement. • finally, learning methods for maintaining an effective learning environment throughout the year. COMP's goal for teachers is to help improve their overall instructional and behavioral management skills through planning, implementing, and maintaining effective classroom practices. Such practices provide a framework for order and organization in classrooms and provide opportunities for students to begin to manage their own learning opportunities. 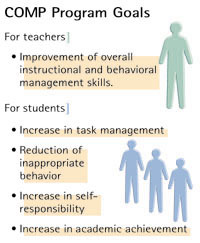 Additional goals are to improve student task engagement, reduce inappropriate and disruptive student behavior, promote student responsibility for academic work and behavior, and improve student academic achievement.